If you have tech website and you are looking for a free IT business WordPress theme which can attract more viewers to your website then SKT strong is the best option to go with. This free it business WordPress theme supports all important plugins which you would need to grow your business substantially. This theme is based on WordPress customizer which means that editing of this free IT business WordPress theme is very easy and you won’t need any coding or development expertise to install it on your website. 1. The overall look and feel of this free IT business WordPress theme are very elegant and by default social icons and call to action have been included in this theme. The elegant look will attract more viewers to your websites so the chances of turning viewers into leads will always be on higher side. 2. This theme has an inbuilt slider which helps the viewers to understand your services more precisely and in a better way. The inbuilt slider of this free IT business WordPress theme has 3 slides which you can always upgrade by purchasing the paid version of the theme. 3. This theme supports Google font by default but as it is a free version of this theme you won’t be able to change it to any other font but if you buy a paid version of this theme then you will have 650 fonts to choose from. 4. SKT strong has passed all the required tests which are important for a theme to pass so that if someone applies the theme to their websites they should not lose their traffic by any way possible. Our motto while making these themes was to help our clients to grow overall. 5. If you want a testimonials section, a team member section or a client logo rotator you can easily add any of these things on your website by adding shortcodes to the homepage or inner pages of your websites and this theme is compatible with shortcodes plugin too. 6. This free IT business WordPress theme also supports plugins like Woocommerce and contact form which means with this theme you can also start a business online because of the compatibility of woocommerce plugins whereas you can also get feedback or any suggestions from your customers because of the integration of contact form plugin in this theme. 7. 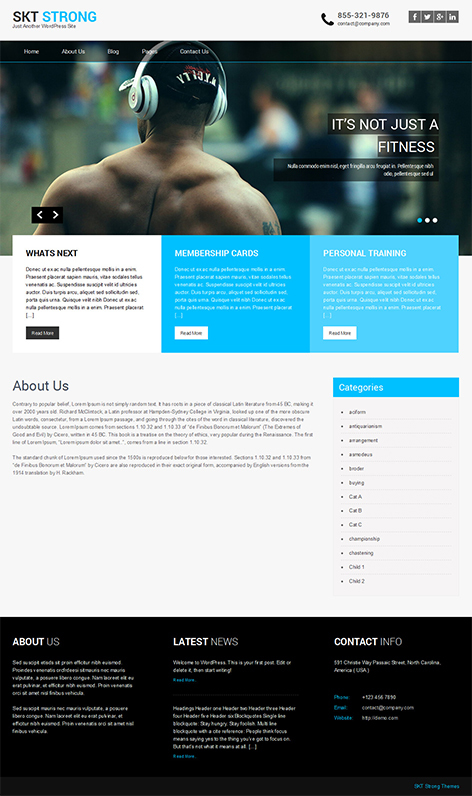 This theme is a multipurpose theme you can use it on your personal blog, business website, corporate website, fitness website and the list is never-ending. Multilanguage support has also been provided with this theme because this theme has also passed the multilingual test. 8. Translation plugins are also compatible with this theme which means now you can reach to different audiences at once from the different part of the world. 9. This is a customizer based theme which means you can see the applied changes on a real-time basis and the customization process is very easy and no expertise is required to build a website with this theme. 10. The color scheme of any theme matters a lot because the colors of anything are the first things which attract the viewers at first. Keeping this in mind this theme comes with default blue and white colors which both are very attractive looks appealing to the eyes of the viewers. If you are looking for a free theme which comes with all basic features of customization then this free IT business WordPress theme is best for you. SKT strong is a responsive theme and has all the feature which one can expect from a WordPress theme. When you purchase this theme you will get documentation as well as theme files in a zip folder and the documentation acts as a savior in the times of difficulty. Everything is clearly stated in the documentation for your benefit. The appearance of Call to action and social media icons on the top of this theme helps in making a bond with the customers in a considerate way because if they need to contact your company they won’t need to wander around the internet to find your contact information because they can easily find it on the homepage of your website. This free IT business WordPress theme is compatible with all the browsers available in the market right now and is also compatible with all the devices like PC, smartphones, iPads etc which makes this theme perfect for those who are beginners and starting their blogs or websites now.